I can’t believe it is already August! That means summer is almost over and school is just around the corner! I went to Target the other day and as I walked by the school supply section, I noticed all the excited and noisy kids hustling and bustling around to find their school supplies. I also noticed the worn-out looking parents trying to keep up with their kids. It made me smile as I remembered being that age and being SO excited to pick out school supplies and get them all ready for school (even if it was still a few weeks away!). And when I was a teacher, I took advantage of the great prices and stocked up for my classroom. Now, as a mom of a preschooler and toddler, I still love it when they bring out the school supplies because I stock up for our home! 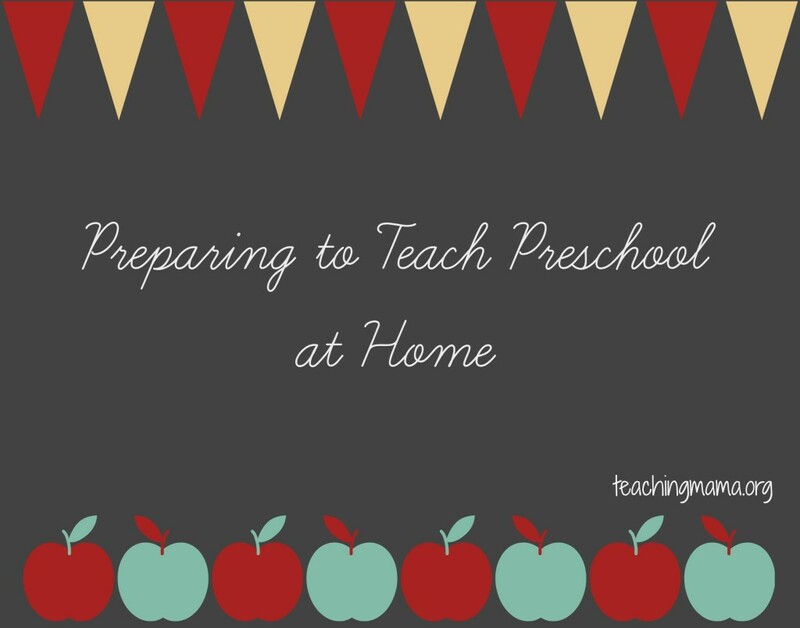 Today, I thought I would share with you some supplies I think are needed for teaching preschool at home as well as my thoughts on preparing to teach preschool at home. The organizational cube and fabric drawers I use are from Target. I keep our picture books in the top three cubes. It’s the perfect height for my little ones to take and put away books. The fabric drawers work well for organizing our materials and keeping everything looking neat. Here’s a look at what’s inside each drawer. 1. This container holds our alphabet sound box, Bananagrams, and a matching game. 2. I keep all our current lesson materials in here. It makes it easy for me to organize and access materials while we are doing lessons. 3. We do art projects almost every day, so this container help us keep everything organized and all together. 4. I keep tools for sensory bins here. There are funnels, cups, tongs, tweezers and more. 5. This container holds our homemade playdough and accessories. 6. In this bin are counting bears, magnetic pom poms, pony beads, and magnetic letters and numbers. 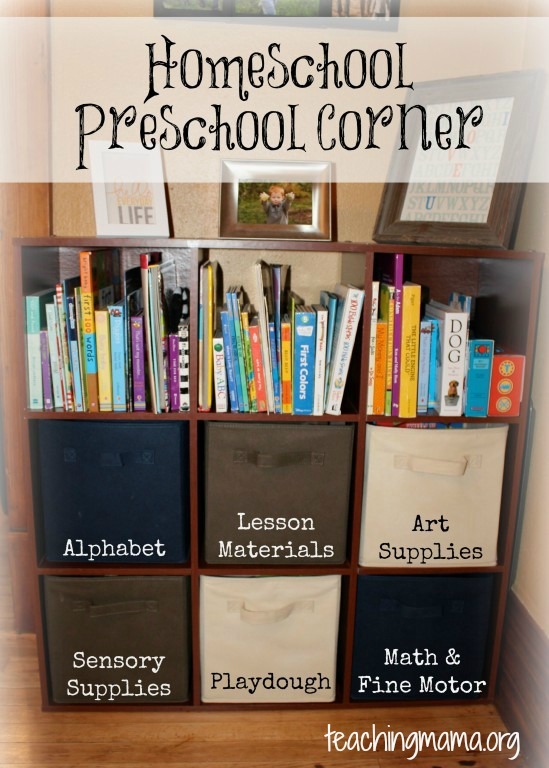 The two biggest advantages to setting my preschool corner up like this is that it’s easy to keep everything organized and my kids know where everything is. They are able to get materials out by themselves and know where to put them back. I also have a small desk for my oldest child. It sits next to my desk and it’s the perfect size for my 3 year old! I wish I could share where this is from, but I found it at Goodwill for only $10! I keep our printables in an accordion file that I found at Office Max. It is perfect for keeping all loose paper organized!!! 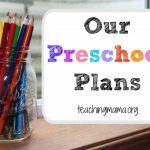 I also have a preschool planning sheet that you can find on this post. It helps us stay focused and organized! 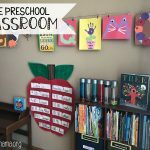 I am always pinning toddler and preschool ideas on Pinterest, so if you want to follow me, you can follow me here. 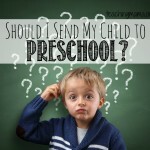 If you still want more ideas or need a curriculum to teach your preschooler, you can take a look at my ebook I recently published called The Preschool Journey. For more information about the ebook, you can visit this page. 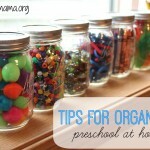 How do you organize your preschool at home? Have any thoughts or suggestions? I love waking up to see what you have posted for the day! This is great. We are actually headed to target today for supplies and my wish this year is a laminator. 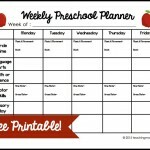 I am going to be making a similar preschool schedule for the week but a little different. Definitely need a nice alphabet file folder though! Thanks, Sarah. You are so sweet! You are so creative yourself! Hope you got some good school supplies! Looks amazing! Great job!! I’m hoping to start getting organized today! Thanks, Erica! Hope you have a great start to your school year! Thanks! Haha, I understand about re-organization! Oh and we LOVE fabric boxes! Thanks! I was so happy to buy this little desk! Wow, so organized! I’m feeling inspired to go get our room in shape! Haha thanks! I do love to be organized, and it may just be an “oldest child” trait. But there are areas in our home that still need some good organizing! You’ve inspired me to keep trucking with the setting up of a preschool area. 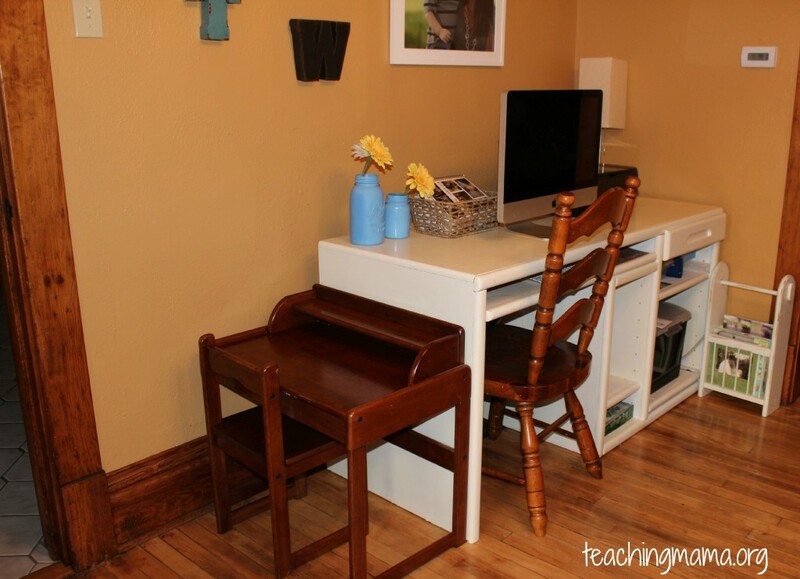 I found a great deal on Craigslist for my twins’ desk (it was a twin desk how could I refuse). That will free up their old workspace for their brother who starts preschool. I was so proud of myself for controlling my teacher impulses to buy everything in the Target School supply section but this blog isn’t helping!!! LOL. 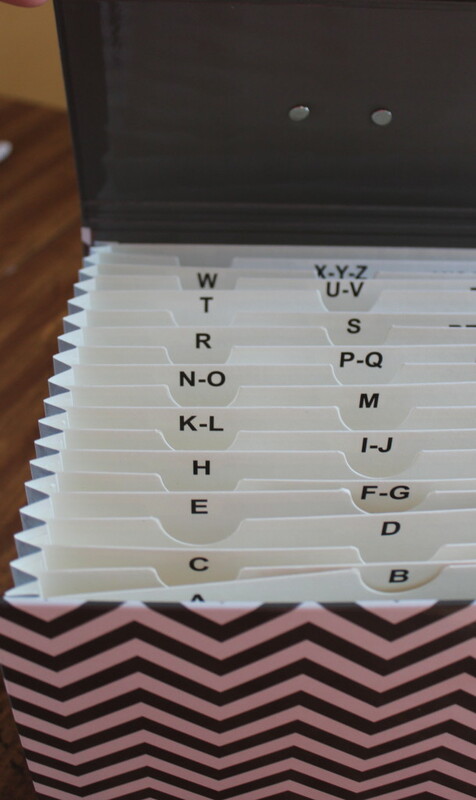 Great ideas on organization. 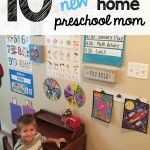 I love how you’ve organized your preschool at home! Pinned and featuring at Family Fun Friday! Monica recently posted…WIN an iPad Mini – Homeschool Giveaway! 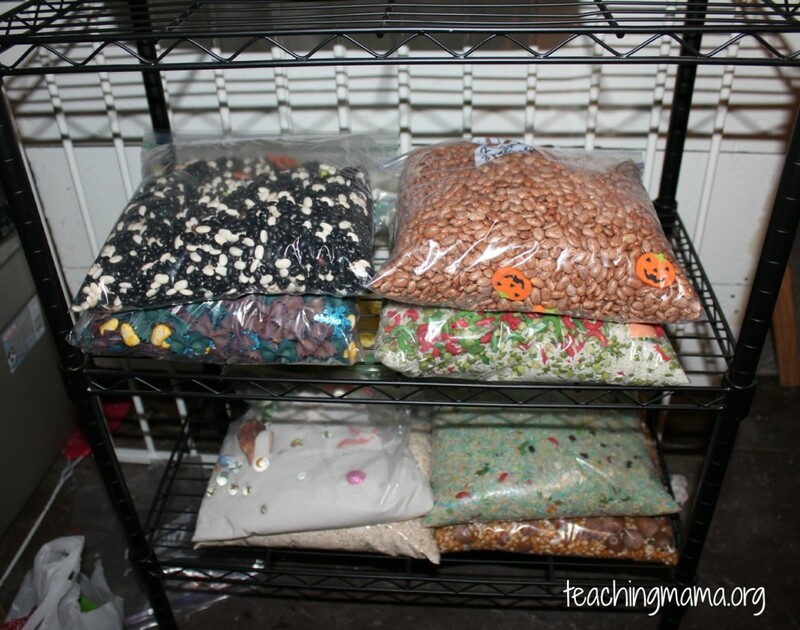 I’m so happy to found out your blog and specially the way you shown how you organize everything to homeschool. It was always a big doubt for me. Thanks for sharing a bit of your life here. It’s helping me a lot to improve many things here with my boys (J is turning 5 and T turning 1 next week). May God bless you on your way! Thank you so much for your sweet comment! I am so happy you are here! Thank you for taking the time to comment!